One issue that biking activists may need to address with the Fairfax County School Board is the official prohibition of bicycling as a school sponsored activity. I assume it is because of liability concerns, but I find it very unfortunate that teachers and parents cannot sponsor official after-school bike clubs for students. In younger grades, these could be organizations that teach bicycle safety and sponsor fun bicycling events. In middle and high school, schools could have mountain biking teams and cycling teams. In a county with such superb mountain biking trails, for instance, it is a shame that we cannot have mountain biking clubs or teams in our schools. Supporting biking as an activity among our schoolkids is one of the best ways to develop a new generation of riders who will care about investing in better bicycling infrastructure. "The following list is to provide guidance to school personnel who plan activities and events for students. A prohibited activity listed below cannot be sponsored by Fairfax County Public Schools (FCPS). Now, I think most of these prohibitions are very reasonable, but to lump bike riding in along with tattooing and parasailing is pretty absurd! Would love to get FABB involved in the mission of getting bike riding removed from this list! Thanks for your comment. Our SRTS group is well aware of the ban and getting it overturned is one of our goals for this year. We can use all the help we can get so if could write to you school board member, that would help. Tomorrow two of us are meeting with staff and parents at an elementary school in McLean. They plan to implement a bike to school program The issue of bikes being banned as a school activity will come up, so your comment is well-timed. We'll see if we can get some support for getting the policy changed. As an avid recreational cyclist I am concerned about the lack of "Share the Road" signs in the County, especially on back roads that are popular cycling and training routes such as the Clifton and Mason Neck areas, among others. Adding signage seems to be an inexpensive way to alert drivers that 1) bikes are on the road and 2) inform them that cyclists have a right to be on the road. Is there any plan by the County to add signs and if not, is this something that FABB is asking the County to implement? The draft bicycle facilities maps include several roads where improved signage is recommended, including in the areas you mentioned. In Clifton signage is recommended on the uphill segments of popular routes as well as pullout areas where cyclists can choose to pull off briefly to let cars pass. It's been a year since the draft plan was presented to the county. FABB is advocating for approval of the plan; progress has been unacceptably slow. Thanks for the response. Is there something that concerned cyclists can do to help advocate to get some of the recommendations implemented? I would ask your county supervisor why it is taking so long to get the plan approved. 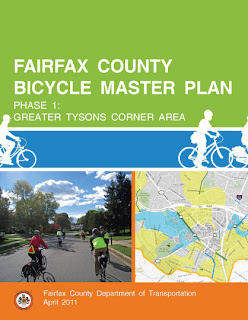 We need more resources, financial and human, devoted to making Fairfax more bike-friendly. Arlington has a much smaller population with 2-3 times as many people working on bike issues. The Board needs to figure out how to make those resources available.